EVERYONE is queueing up to pay tribute to Thierry Henry, who announced his retirement from football today. In his time at Arsenal alone, his stats were preposterously great. For the Gunners, he bagged a whopping 175 Premier League goals, and during his time there, he found the back of the net every 122 minutes. He also landed two Premier League titles, three FA Cups and two Community Shields, was part of the Invicibles, won four Golden Boots, hit 226 goals in all competitions, chipped in with over a century of assists and everyone kinda fancied him. Not bad for a player who Arsene Wenger signed as a winger. If you include the rest of his career, where he played for Monaco, Barcelona, Juventus and New York Red Bulls, Thierry managed to score 360 club goals in 792 games and bagged 51 goals in 123 matches for France. With all that taken into account, let us look at some of the best (and worst) of Thierry Henry’s career! 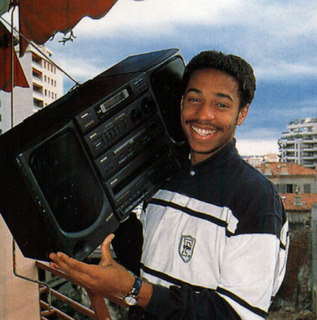 For everything Henry has done, he’ll never top this photo of himself with a boombox. Possibly Henry’s most famous goal. Certainly one of the best goals ever scored on English soil. Henry could pretty much do everything, but his second goal in his famous hat-trick against Liverpool takes some beating. Thierry was no wimp and could throw himself around if needed. In the World Cup in 2002, he was Sent off for a late tackle against Uruguay during France’s disappointing tournament. Henry wasn’t too shabby at Barcelona, winning the Champion’s League with them. His goal against Celtic is one of his best in the famous shirt. When in the USofA, Thierry didn’t stop being brilliant and getting fans out of their seats. He scored a number of great goals, but our favourite is his effort against FC Dallas. Henry’s handball against Ireland in the World Cup play-off saw France on the plane to South Africa. The Irish were heartbroken and the thing that hurt most was the fact it was one of the most loved players on the planet who cheated an underdog out of the game. How much do Arsenal love Titi? 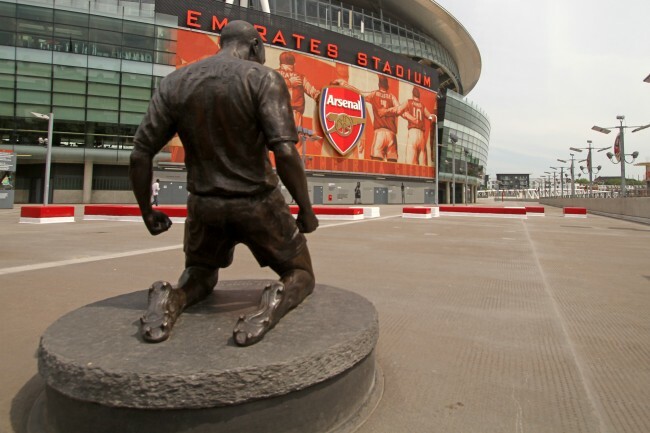 So much so, that they unveiled a bronze statue of him outside the Emirates Stadium. Weeks later, Henry returned to play for The Gunners during their 125th anniversary celebrations for a couple of months. Trying to win at Real Madrid is difficult enough, but Henry popped up to score an inspired winner for a famous Arsenal victory in Spain! When Henry returned to Arsenal, he knew how to make a proper comeback. Getting behind the Leeds’ defence, he smoothly knocked the ball into the back of the net and the Gooners went properly wild. Magical moment. Most footballers do advertisements that make you want to die. Not Thierry Henry. He suavely said “Hey! Bobby! What’s the French for Va Va Voom!” and played jazz drums with Animal from The Muppets. Brilliant.